If you’re having a January health or weight loss kick you’re probably looking at your diary right now with abject sadness wondering how you’re going to be able to leave the house and still stick on plan – but behold, Bella Italia have the answer. The launch of their new low-calorie, low-carb dishes. Look that’s one above, can you guess what it’s secret is? 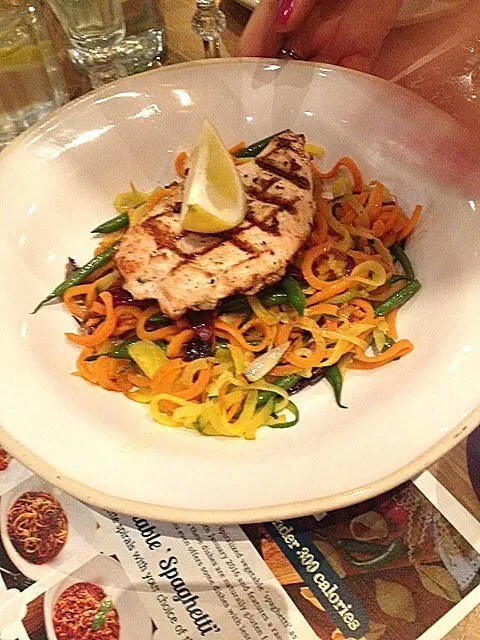 That’s right, it doesn’t use pasta – instead, they are putting sauces on top of spiralised courgettes, beetroot and carrots and it’s seriously slashing the calories. 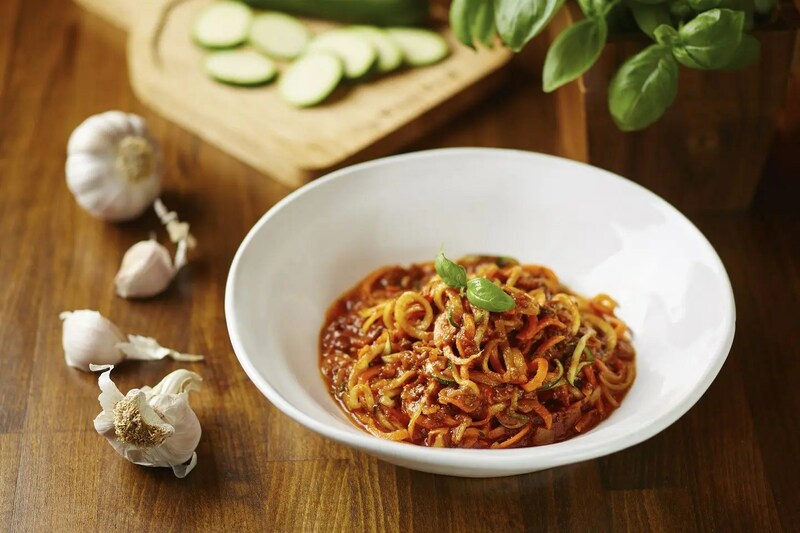 Their lowest calorie dish, the Pomodoro, is just 134 calories per serving. You’d burn that off walking to the restaurant and back! There’s five dishes in the special Bella Italia menu overall and a few months I was lucky enough to try the entire menu (sharing it with a few others – not even I could eat five entire bowls even if it was mostly courgetti) and it’s actually really, really good. There’s not a duff dish on the menu. My absolute favourite dish was the Bolognaise above which uses a beef ragu on top of the spiralised noodles and comes in at 282 calories. Winner for The Boyfriend was the 259 calorie Gamberoni made from garlic sautéed prawns in a spicy tomato sauce (that’s the pic at the top). The Pomodoro is also pretty good – but I admit I did have to add a tiny amount of Parmesan cheese to lift it a bit which did add a few calories – but hey, at 134 per dish you can afford those right. As an added bonus all the dishes are also gluten free and, if you’re watching fat levels as well as calories, the Pomodoro and the Agnello contains less than 3 percent fat. With their veggie base they also count as one of your five day. It’s such a brilliant idea – the menu is running through January but if people like it there’s a chance some of the dishes will stick around for good so, get in there and start ordering your favourites. Should you not trust yourself to just stick to one course, some of the starters on the menu (and each single mini dessert) also come in at under 300 calories, so you could start with say, the Isalata Rosso (tomato, olive and onion salad) or the Bruschetta and have the Agnello and still have under 500 calories! To find your nearest Bella Italia branch here’s where you’ll find the address and the dishes launch from today (January 5th) at all the restaurants nationwide. NB: 7/1 The first draft of this post talked about a sixth dish – a second chicken salad – however, this was left off the final menu. This post has been edited to reflect the change.